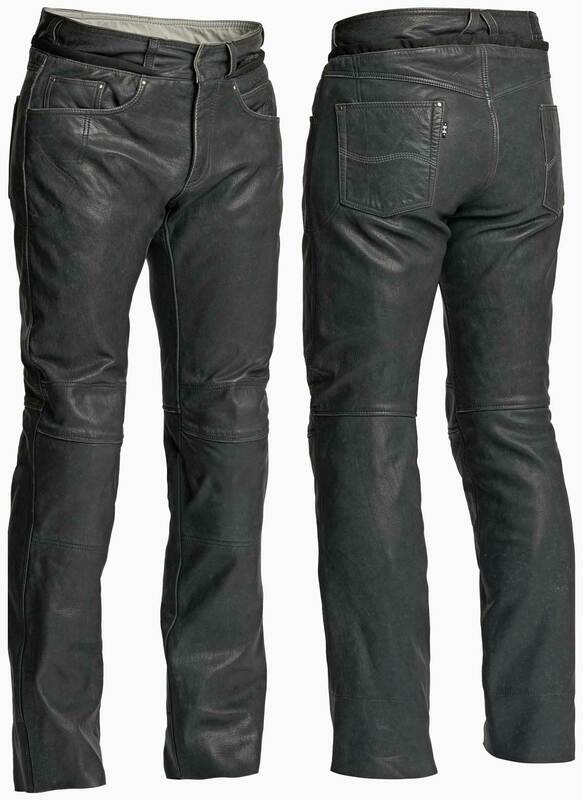 HALVARSSONS SETH LEATHER PANTS REVIEW A LEATHER PANT YOU DON'T NEED TO BE A ROCKSTAR TO LOOK GOOD IN! Okay, let us be clear on this one; we spend a lot of time in the shop here in Guildford explaining to customers why leather is not best when it comes to motorcycle clothing. Leather hasn’t changed in thousands of years. It's still just the skin from a cow or some other quadruped. Leather has no natural thermal properties, so it’s useless in the cold. When it’s hot, leather doesn’t breathe very well, so you sweat. And when it rains, leather is a liability. It soaks up the rain like a sponge, so you get both cold and wet. And it’s not even as though leather is safer or more protective than modern textiles. Heck, we have single-layer jeans that are 50% stronger than leather. Which is why, if you’re a serious commuter or a dedicated traveller, we reckon that leather jackets and pants are just a bit old school. Most riders, most of the time, will be better off wearing textile garments. But that doesn’t mean there’s no place for leather in a modern motorcyclist’s wardrobe. There’s something ineffably cool about a leather biking jacket, which is why every motorcyclist needs at least one. Nothing looks like leather. Nothing ages like leather. And as you wear leather it moulds itself to the shape of your body, so nothing fits better. Brando, Presley, McQueen, the Fonz, Arnie; none of them got famous by wearing a highly spec’d technical, Gore Tex jacket fitted with CE armour. Sometimes only a leather jacket will do. And from our standpoint, the same applies to leather pants. We wouldn’t commute in a pair. We wouldn’t go touring in a pair, but deep down we all want the opportunity to look cool in leather trousers. We’re not talking about racing leathers with knee sliders and a calf-gripping elastication. Nobody looks cool wearing racing leathers. No, we’re talking about something far more rock ‘n’ roll. The problem is that many of us look mildly ridiculous in a pair of tight-fitting leather pants. Not all of us, but certainly most of us. Not everybody can carry off that whole glam-rock thing, and at times leather pants can just make you look like you’re trying too hard. In the five years since we set up Motolegends we’ve never found the perfect leather pants. Some just look wrong. Some are too heavy. Some are too shiny. Some are too stiff. And some just don’t fit very well. What we’ve been looking for, for all these years, is a simple and straightforward five-pocket, Levi 501 style jean in a soft and supple leather that you could comfortably wear all day, and that wouldn’t make you look like a hairy-arsed biker. Well, it would seem that our prayers have been answered by, of all people, Halvarssons. Now Halvarssons have had a pretty nice leather pant in their collection for a number of years. It’s called the Rider Pant, and it’s made from a beautiful, soft goat’s leather. 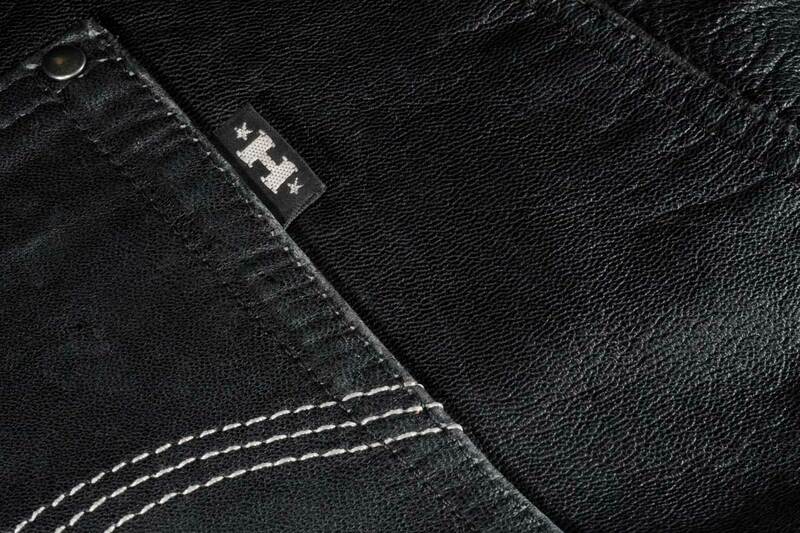 Well, the new jean from Halvarssons is called the Seth pant; and it too is made from goat’s leather. Now goat’s leather is quite thin, but for its thickness it’s much stronger than cowhide. Which is why it’s perfect for motorcycle wear. Now even though goat skin is super strong, in the Seth pant it is reinforced in all the vulnerable areas with an anti-abrasion lining called Hi-Art. It’s like Kevlar, although it’s construction is very different. The important thing to know, though, is that it strengthens the leather by a factor of 200% (ie x3). All the seams on the Seth are triple stitched for extra strength and, of course, the jeans come with armour in the knees and hips. If you want to wear them over full-length biking boots, as opposed to short boots, you should be able to, although they won’t accommodate a proper off-road boot. Now a jean is not something you would normally attach to a jacket, but as this is Halvarssons, there’s a full length zip so that they can be zipped into any Halvarssons top; textile or leather. Coming from Halvarssons, the Seth jean is about as practical and sensible as a leather motorcycle jean will ever be, but what we love about these jeans is that they just look like a pair of denim jeans, albeit in leather. 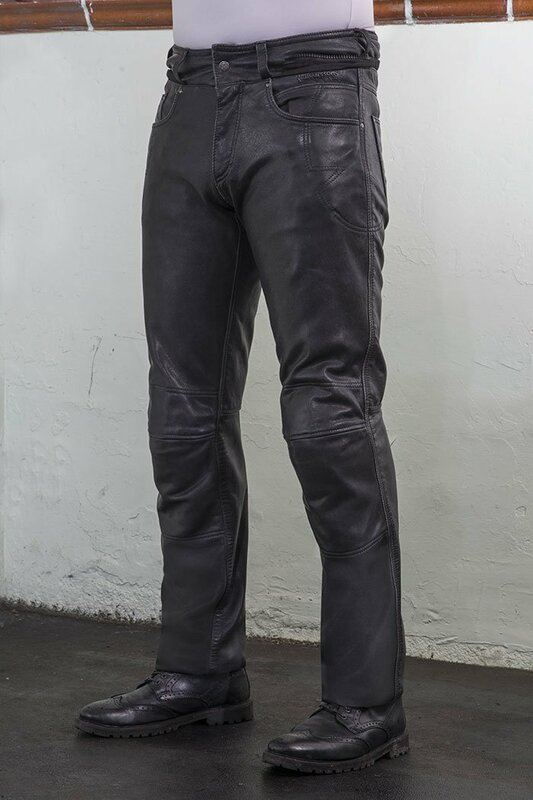 They’re the nicest leather biking jeans we’ve ever come across. We like them a lot, and we think you will too.